Sabbath, March 3rd - Psalm 150:6 - Praise the Lord! Atonement, Sabbath, October 20th - Hebrews 7:25 - Atonement - Saved to the Uttermost! Sabbath, November 3rd - Galatians 4:19 - Until Christ is Formed in You! Set up demonstration: Place the bar magnet over the top of the glass. Tie a piece of string to a metal paper clip. Let the paper clip touch the magnet on the bottom side of the magnet. 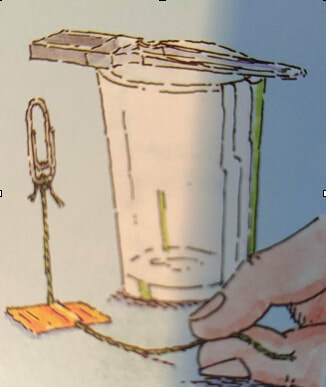 Run the string from the paper clip down to the table and tape it so that the string can slide. Put the paper clip away from the magnet slowly. The magnet will have enough attraction on the paper clip to make it look like it’s standing straight up. You are like that paper clip that is attracted to God and His ways. When God starts working with you, you want to spend time with Him and learn more of His ways. But relationships don’t stay static: you either grow closer together or you grow farther apart. You can pull the string/paper clip far enough away from the magnet that it is no longer attracted. In a similar way, in your life, you can allow other things to pull you away from God. God hasn’t moved, but you have chosen a path where you miss the closeness and relationship with God. Think about the choices in your life. Which of your choices strengthened your relationship with God? (Things like observing the Sabbath and Holy Days, praying, studying your Bible, talking about God with other people, doing kind things for people because you love God.) Which choices made you feel more distant from Him? (Things like reading ungodly books, listening to ungodly music, making the choice to break God’s laws and to spend time with people who break God’s laws.) Then think about things that happen to you which can cause you to take your eyes off God. (Things like being upset about money, not feeling well, a fight with your best friend) When you start worrying (overly or excessively) about the future, you’ve taken your eyes off God and allowed yourself to become distracted from Him and His promises for you. Don’t you love how God has given us simple things like magnets and paperclips to remind us to daily seek His kingdom and His righteousness - to be attracted to Him and His ways above all else? Demonstration: (It takes a while to make all these cuts, so plan to talk while you’re cutting.) Fold a piece of paper in half the long way. Make cuts parallel to the top and bottom starting about 3/4 inches from the top. The first cut will start on the side which has the fold. Cut almost all the way through, but stop about an inch from the edge. Make your next cut from the other side, cutting almost all the way through, stopping about an inch from the edge. Continue cutting your paper, alternating the side from which you start, until you have cuts which are parallel to the top and the bottom all the way down the paper. Your last cut should start from the folded side. Then go back and cut along the fold on every strip where it’s not cut all the way through. Be careful not to cut the top or the bottom. When you lift the top edge, you’ll have one large circle of paper that you could step through. These are recorded miracles that our Great God has done. He is the Creator of the universe; He certainly can do anything He wants - whether it’s making water stand up in a pile, changing water into wine, or giving life back to those who had died. Those miracles are not just tricks; they aren’t stories to entertain. They are facts in which we believe - and our beliefs are reflected in what we do. That is, if you believe God can do anything - He can shut the mouths of lions, He can heal a person born blind - then you choose to worship Him because He is God and He is Great! Now, if I asked you if you could walk through a piece of paper, you’d probably say no. That’s silly. No one can walk through paper. But I’ve cut the paper so that it’s one big circle now - a circle large enough for me to walk through. The difference between what people can do and what God can do is the difference between tricking you and something that is a solid miracle. God’s miracles aren’t tricks. They are real. Demonstration: Touch a paperclip to a magnet. Then touch another paperclip to the end of the first paperclip. What happens? The magnetism travels through the first paperclip and attracts the second paperclip to the magnet - through the first paperclip. So something that wasn’t magnetic becomes magnetic - as long as it’s touching the magnet. How many paperclips can be put in the line of paperclips held only by the next closer paperclip? I love how God gives us physical experiences to help us understand the spiritual reality. There’s a couple of very interesting principles at work here. First, just as the second paperclip was attracted by the magnetism of the first paperclip as long as the first paperclip is still touching the magnet, so people can be attracted to Jesus Christ as long as we stay connected to Jesus. In other words, we allow others to see Jesus in us - and if we are truly allowing the light of God to shine in our lives, it can be very attractive to them. An interesting thing happens as you play with the paperclips and the magnet. Eventually, the second paperclip flips over and makes its own connection straight to the magnet. You can’t get it to re-connect only to the first paperclip. The attraction to the magnet is too strong. In a similar way, we don’t want people to continue to be connected to Jesus through us. We want them to have their own connection to Jesus. Second demonstration: Light a candle. I only have one match. But I can use that candle to light another candle. In the same way, if I share the gospel (the good news) of Jesus Christ to the people around me (shining my light), then they too may be attracted to God’s truth and begin to shine the truth to the people around them. There’s a saying: you may be the only Bible anyone ever reads. That’s because there are people out there who never read their Bible. So you may be the magnet or the light which attracts them to Jesus. Or if you’re not connected or not on fire, you can miss that opportunity for someone to come to know Jesus. You can have an impact, for good or for bad, on every person you meet. And you never know who is watching what you do and what you say. So it’s an important thing to remember when you are out with your friends or out with your mom - you can attract others to God, if you allow God to work through you. Secondly, if you have more than one paperclip attached to the magnet, you can pick up a longer line of paperclips. When we work together as a church body, we have a greater chance of reaching more people with the love of God. You may be really good at listening. Your sister may be very loving. Your brother may be very kind and gentle. People see different characteristic traits in our church family that draw them to fellowship and be drawn closer to Jesus Christ. So as a church family, we not only have a greater impact on the people around us, we also have a greater impact - as a church body - on the rest of the church body. The more people there are, the more we are tied together. And the Bible affirms this observation in Ecclesiastes 4:12, “A cord of three strands is not easily broken.” Or if you bring three candles together, the fire that they make can shine light farther than just one candle can by itself. Jesus told His disciples (and by extension, all of us) to preach the gospel to the whole creation. In addition to our words, our actions can also be very attractive to others. Our actions shine God’s light because they are seen. And, when we come together as a church body we are more effective, more attractive, and shine more light than each of us alone, by ourselves. Jesus gave us a job to do. Let’s preach the gospel faithfully and efficiently as God leads us. (Sharing the optical illusions:) There are some amazing optical illusions out there - drawings and paintings which look real, but aren’t, or which make you think you’re seeing one thing but suddenly switches to appear that you’re seeing something else. Some optical illusions trick your eyes into thinking the drawing is moving. There are so many things in our world which aren’t really what they appear. There are people who do this just because they think it’s funny. There are other people who are trying to deceive because they are mean. So how can you guard yourself against the schemes of people who want to try to trick your eyes into thinking something is true that really isn’t? Our Bible verse says, “Prove all things; hold fast that which is good,” (1 Thessalonians 5:21). How do you prove all things? You have to have a standard to prove something against. What do you think that standard has to be? You have to use the Bible. The Bible is God’s word. It is true. It is trustworthy. What if someone tells you that it’s okay to steal a candy bar while you’re standing in line at Walmart? You know that God says, “You shall not steal” (Exodus 20:15). You have proven that it’s not okay to steal. If you love God, you hold fast to that belief - and you don’t steal. What if someone tells you that it’s okay to lie? People lie when they tell the Department of Transportation how much they weigh for their driver’s license. People lie when someone asks them if they have ever taken something that didn’t belong to them. People lie when they are asked if they read the Bible yesterday. People lie when they are asked if they lied yesterday. Is it okay to lie? Jesus Christ not only said that He is the Way, the Truth, and the Life (John 14:6), He also said that there will be no liars in God’s kingdom (Revelation 21:8). ​Someone could tell you that it’s okay to yell at your mom or your dad if they do they something wrong. But you know that God says to honor your mother and your father (Exodus 20:12). Yelling at them, or hitting them, or being disrespectful in any way is not honoring your mother and your father. What if someone says that we should worship God every day, so it’s good to go to church on Sunday? You have to go back to the Bible to prove whether that’s true or not. God says that He set aside the Sabbath (Saturday) as the day to keep holy (Exodus 20:8-11), so we go to church to worship Him on the Sabbath (Hebrews 10:25; Acts 13:42-44; Acts 17:2; Acts 18:4). These are the easy ones. But there are so many things that people believe that are not based on the Bible. You can be fooled by their words or by the things that you see in their lives. If what you see doesn’t look like what you see in the Bible, you let go of it. Prove what is true and hold tightly to that. That means you’re going to have to do something every day. Do you know what it is? You’re going to have to pray to God and read your Bible every day. If you don’t talk with God and read what He says to you, how are you going to know what is just an optical illusion? Psalm 119:11 says, “Thy word have I hid in mine heart, that I might not sin against thee” (KJV). If you know what God has said, it’s easier to see the illusions. Imagine a group of youngsters in the church family hiding their faces in their arms so they can’t peek. If random church members speak to the children, would the children be able to identify who is speaking? *Does the person address each child personally? *What does the speaker ask the child to do? *Does the person speaking try to disguise his or her voice? *How well do they know the person speaking? *What is the proximity of the speaker to the child? There are incredible parallels to our walk with Christ! If you are very close to the child, they are much more likely to be able to correctly identify who you are. There aren’t the distractions of distance. And, if you were right next to them before they closed their eyes, it’s likely because they have a relationship with you. That dramatically increases the chances of instant recognition!! So how close are you to Jesus? Do you talk with Him every day in prayer? Do you read your Bible every day so you know what He says? Do you spend time thinking about God and the choices you make? How close are you to God? If the speaker has spent a lot of time with the child, it’s much easier for the child to identify the speaker. This is closely related to proximity! But remember, God isn’t going to spend time with you when you chose to sin. Sin is abhorrent to Him and He wants nothing to do with it. So if you want to be close to God, you have to make Godly choices. The Bible tells you what Godly choices look like. Closely related to this is what the speaker asks the child to do. If it is a normal request, the child may know right away who it is that is speaking. Similarly, when we are familiar with what Jesus asks of us (like Micah 6:8 or Romans 12:10 - love one another with brotherly affection), then when we recognize what is asked of us, we know from whom the request came. If the speaker calls the child’s name before speaking to him (or her), the child’s attention is heightened. Furthermore, if there’s been interaction between the speaker and the child, the child has likely heard the speaker use his or her name before. It sounds familiar. Both of these aspects make identification more likely. Do you know that Jesus knows you by name? Do you realize that God chose you? You are special to Him. You’re not just another warm body. He has a special plan and a special place for you. Jesus said, “My sheep hear my voice, and I know them, and they follow me.” But you can’t hear Jesus’ voice and you can’t follow Him if you’re not paying attention! Are you listening and paying attention to what God is telling you? Don’t get distracted by other people around you. Don’t become distracted by the things that you have to play with or the activities you have planned to do. Get rid of the extra things in your life. That way it won’t be so cluttered with stuff and tasks that you can’t pay attention to what is really important: having a close relationship with God. Let’s work on being able to recognize that voice and be ready to do what He says. Let’s suppose you have some really yummy hot chocolate mix. What could you add to it so that you would not want to drink it? Let’s suppose you have some really wonderful smelling hand soap. Could you add something to that which would make you not want to use it to wash your hands? Let’s suppose you have bug spray. Is there anything you could add to it that would be so repellent to you that you wouldn’t want to put it on your body to repel bugs? So consider people for a minute. We don’t think about being like hot chocolate mix or hand soap or bug spray. We don’t think about things which are added to who we are that would make us yucky. But God says it happens. When you are around someone for any length of time, you pick up some of their characteristics. For instance, some people hear accents and they pick those up easily. I know that when we were in Canada for the Feast, it didn’t take long before we were ending every sentence on a higher note. It isn’t something we tried to do; it was something which stood out to us and it wasn’t long before it was part of our talking patterns. When I was in college, I used to say, “Neat, neat, neat.” After four years of having class with one particular music professor, I rubbed off on him. When he said, “Neat, neat, neat” one day in class, everyone looked at me, knowing that I was responsible. But you don’t always just pick up positive traits from others. If you are around someone who uses bad language, it’s very difficult to keep those words out of your head. Your brain is like a closet never cleaned out (as Ron Dart once said); those words go in there, they rattle around, and sometimes they come out again. It doesn’t have to be just bad words. When Jennifer and I were in a grocery store just before Christmas this past December, they were exclusively playing Christmas music. Without even realizing what I was doing, I started singing, “God bless ye merry gentlemen.” Now, my family stopped celebrating Christmas when I was five! How is it that I know all of these words? Jennifer looked at me very strangely. She was wondering the very same thing!! You pick up words from the people around you. You also pick up actions from the people around you. If you are in a cave and the guide tells you not to touch any of the cave formation because your hands leave mineral deposits behind, what’s the first thing someone will do? They’ll reach out to touch a cave formation close to them. How do you know? Because the formation has been worn smooth by all of the hands touching it! And people think, “If someone else did, it won’t matter if I do it as well.” If the speed limit is 55, but everyone is going 65, what do you do? You speed up to move with the flow of traffic!! It’s breaking the law, but everyone is doing it. What if Mom tells you that you can’t have a cookie before supper, but then you see your older sister sneak a cookie? What do you do? You think, “She got one. I want one.” If your Mom catches you, what do you say, “Sister got one.” You don’t tell your mom that you’re sorry; you use the disobedient behavior of someone else as an excuse for you to be likewise disobedient. Does it matter? Does God care about your behavior, or your words, or your thoughts? Yes!! There are so many verses which talk about your choices, that they need to be Godly! If you know this to be true, then you need to carefully consider with whom you spend your time. They are influencing you - for good or for bad - they are influencing you. When Jennifer was very little, I was working on her obedience. I gave her two M-n-Ms and told her to give them to Jonathan. She really wanted to just eat them, and I had to scold her to get her to obey me. She gave the candy to him. Jonathan took them and said, “Thank you,” and then he gave one back to her. Sometimes when you give to someone else, there’s a reward. If you are giving and generous, people will tend to be generous with you. If you smile at someone in church, you will likely get a smile right back. If you want a friend, you have to be friendly. Out in the sandhills where my grandparents’ ranch is, the neighbors all help each other with cattle work. It’s hard to brand all of your calves by yourself. And no one wants to hire help to brand; it’s hard enough to make all of the ends meet. But if everyone helps, the job can be done quickly and then you can enjoy the rest of the day with your neighbors. So the ranchers take turns having brandings. One day it’s over here. Two days later, it’s over at another ranch. Everyone knows who works really hard at all the brandings. And everyone knows who kind of slacks off and let’s everyone else work hard. Think about it: If someone works really hard at your branding, you’re a lot more likely to be willing to jump in and work hard at his. But it gets really tricky if you’re focused on what you get back. If you give just so you’ll get something back, you’re likely to be disappointed. What if Jonathan hadn’t given an M-n-M back to Jennifer? He didn’t have to. It was his right to eat both of them, if he’d wanted to. What if you are generous to someone, and they never give you anything in return? Are you then angry at them because you helped them so much and they didn’t give back? Were you only giving because you wanted to get gifts in return? What happens if you smile at someone at church because you want a smile back - and the person you smile at is having a bad day? Are you then sorry you smiled at them? Are you just smiling for what you can get out of it? Or are you smiling because you genuinely like them? If I give you a sticker or a sea shell, what’s my motivation? Am I giving them to you because I expect you to bring me a gift next week? Or am I giving them to you because I want to see you happy, because I like you? God is very pleased when we are generous with our time and the things that we have, when we give because of our gratefulness to Him for the abundance that He’s given us. And the truth is, if we give because we sincerely like people, because we sincerely want to see them happy, because we are sincerely grateful for what God has done, God has a way of blessing us in return in ways that we could never have imagined! Imagine a group of kids going to help at a local food pantry. They work hard packing bags and carrying groceries for people. Then, when the day is all done, the people in charge at the food pantry are so grateful for the help that they send home bags of potatoes. The kids didn’t help because they were expecting a reward, and potatoes may be, well, small potatoes, but it’s a reward that they wouldn’t have gotten if they had not given of their time and effort. If you easily forgive, truly from your heart, then God likewise will forgive you when you ask. But if you forgive, but are still mad and wish you could get even, then that’s not really forgiving someone. And God likewise doesn’t forgive us. That’s a scary thought! We all want God to forgive us!! Do you see how very important it is to forgive others, not to hold a grudge against them? I hope each one of you learns to be very giving and forgiving - and that you will be greatly blessed by the measure you have given to others! Q. Do you know the little boy threw the clock out the window? He wanted to see time fly. Q. Do you know what you get when you mix a rooster, a poodle, and a kangaroo? You don’t look like a shoe. Do you enjoy laughing? How does it make you feel? Do you feel better when you’re smiling or when you’re frowning? Do you feel heavier when you’re smiling or when you’re frowning? Most of us would rather be laughing than crying. It feels better. And there are a lot of comedians who make a lot of money because people want to laugh - at something! The funniest thing I have experienced in recent years was going to a Tim Hawkins concert. Tim was funny. But the silliest part of the whole evening was when they first came out to warm up the crowd. They said they were checking the sound system. So they told us to laugh like it was a moderately funny joke. Then they told us to laugh like it was really funny. Now imagine a whole auditorium full of people who are laughing. . . at nothing. It makes you laugh just because they’re laughing. Then when they told us to laugh like it was the funniest thing we’d ever heard, I thought I was going to cry because it was so funny! People belly laughing . . . over nothing. It was hilarious! Laughing makes us feel better. Closely related to that is being able to do something we really enjoy. Something that brings us a lot of joy when we’re doing it makes us feel really good. Think of making a snowman after the first fresh snowfall, or jumping in a pile of leaves on a crisp autumn day, or playing in a creek in the summertime. What about eating a fresh peach straight from the tree or a handful of strawberries straight from the patch before they go into your bucket? What about drawing or coloring or writing a song or making up a new game to play with your friends? There are so many things which bring us joy. But be careful. There are things in this world that look like they will bring you joy, but they are not Godly. If God wouldn’t have anything to do with them, you know they will not bring you joy in the end. Sometimes people tell jokes which are not godly, using bad words or which bring bad thoughts to mind. People may laugh at them, but they are not going to lift you up. They will not make you joyful. There are things you find to do which look fun at the start, but if they are not godly, you won’t find yourself having so much fun at the end. It has been proven that people who are joyful are healthier than people who are grumpy. Don’t be a grump. Think about the blessings God has given you. Look for the funny things around you. Learn how to laugh at yourself - because we all do silly things at times. And spend lots of time with God and with God’s people. Nehemiah 8:10 says, “The joy of the LORD is your strength.” Find your joy in the Lord. There are eight sentences in this psalm. Everyone of them is a command. Everyone one of them ends with an exclamation point. We are commanded to praise God for what He has done and who He is. We can use trumpets or lutes or harps or tambourines or strings or pipes or cymbals. We can praise Him by dancing. And verse six makes it very plain, everything that has breath must praise the LORD! Notice that this psalm does not say we have to be perfect in our singing and praising. It doesn’t say that we have to praise only if we’re good enough. It doesn’t say that we praise God only when things are going well. So what is praise? There are a lot of instruments listed in Psalm 150. Can we just bang on the drum and blow on the recorder? Is making noise praising God? Praise is an expression of respect and gratitude towards God. If you’re just making noise, is that respectful? Does it show gratitude towards God? When you praise God, you bring your best (not someone else’s best - your best). You bring your best in humility, knowing that God is so great. You never would want to be disrespectful. It doesn’t work very well to try to be disrespectful and show gratitude at the same time. So you bring your best in a respectful, grateful attitude. But why do we praise God? * Because He is worthy of praise! He is the Great God of the universe. The psalmist says, “Praise him according to his excellent greatness!” He deserves it. * Because we are told to. The Bible is the inspired word of God. That means that even if some man wrote down the words, God inspired him to write them. They are God’s words. This psalm should be taken as a command from God. God said it; that settles it. * Because it’s good for us. When things are going well, what do you do? You praise God for the blessings He has given to you. But what do you do when things aren’t going so well? You should praise God! Do you know the song “Count Your Many Blessings?” The first verse starts, “When upon life’s billows you are tempest tossed [Things aren’t going so well in your life]; when you are discouraged thinking all is lost [It’s easy to become depressed when you are struggling and you don’t seem to be winning. ]; Count your many blessing, name them one by one, and it will surprise you what the Lord has done” [When you start thinking about how much God has blessed you, instead of thinking the trouble you are now experiencing, it has a way of lifting your spirits and putting everything back into perspective]. In other words, God tells us to praise Him because it reminds us of what He’s already done for us and what He’s going to do for us in the future. That gives us courage and strength to keep serving Him with our whole heart. Praising God is good for us. There are lots of ways to praise God. Often we think of praising Him in singing or playing an instrument. But you can praise Him in dancing. You can praise Him in your conversations with others. You can praise Him, and you should praise Him especially, in your prayers. In any case, you praise God with a grateful, respectful heart because, after all, you are part of that group that has breath. Demonstration: Using markers, make a multi-colored design close to the center of coffee filter. Fold the filter in half and then into thirds. Then put the tip into a glass of water. The capillary action will pull the water up, which also pulls the marker up through the filter, making a design. The rainbow is such a beautiful sight! But it’s also a sign of one of God’s promises. After the Flood, God told Noah, “Never again will the waters become a flood to destroy all life. Whenever the rainbow appears in the clouds, I will see it and remember the everlasting covenant between God and all living creatures of every kind on the earth.” This is a promise that God made to everyone (even the animals). There are other promises too. Jeremiahs 29:13 says, You will seek me and find me, when you seek me with all your heart. This is great promise of God. If you really want to find God, He will be found by you. But you really have to seek Him - God says - with all of your heart. Then there’s a promise that God makes with those with whom He has a relationship. God has drawn you to Himself (John 6:44); you’ve wanted desperately to find Him. You know God as your God. Here’s another beautiful promise: I am with you always (Matthew 28:20). These two promises go together. You have to want God and to look for Him with all of your heart. Once God has drawn you to Himself, He will be with you always. There is nowhere you could go that God cannot follow. Do you remember the story of Jonah? Jonah couldn’t flee from the presence of the LORD. When you know God and love Him, you don’t ever have to feel like you’re all alone. God is there. Did you see what the psalmist said, “ . . . your hand shall lead me, and your right hand shall hold me.” This is someone who knows God and knows that God will never leave him or forsake him. God will be with him always. When we make ungodly choices, God is obviously not going to participate in our sinfulness. And God will let us face the consequences of our sinful choices. Having a relationship with God is not a get-out-of-jail-free card. But when we repent and call on His name, when we seek Him with all of our hearts again, He will be found by us. God loves us that much. I love the promises of God. Have you seen any flowers yet this spring? There are some crocuses up - and daffodils! Our apricot tree is blooming. Soon we’ll see forsythia and Bradford pear trees in full bloom. Every spring I see the first signs of life stirring after the gray, drab, dreary end of winter. All winter long, the grass just looks dead. But suddenly, as we move toward spring, little daffodil stalks spring up. Even when it’s too cold for me to want to be outside for too long, these hardy little flowers bloom. How amazing that it can snow, and yet the daffodils stand firm. Likewise, the trees look like they’re dead because the leaves are dead. But the trees are just dormant. They are in a resting mode during winter. But once spring is here, the temperatures start to warm, there is more direct sunlight, the sap in the trees starts to flow. It won’t be long before we see little buds all over the trees. Who creates all of the living things? Who caused them to rest during the winter? Who brings them back, causing them to sprout leaves and produce flowers? God does! It is our Great God who made everything that we see. He is the One who makes the flowers bloom. When I see the flowers, I don’t think about the nursery they may have come from; I don’t think about my neighbor’s yard in which they’re planted; I think about our great God who made something so delicate and beautiful, yet so tough and resilient. Because the flowers are there, I praise God for who He is. How much are you like a flower? Do you live your life in such a way that when people look at you, they praise God for His goodness? That should be our goal. And that’s what the memory verse is about: Whatever you do, do everything for the glory of God. If you’re playing with your brothers/sisters or your friends, you are kind and happy. You’re not selfish and bossy. If your parents ask you to do something, you are respectful and obedient. You are not mad and disrespectful. If you are at the grocery store with your mom, you are polite and respectful to the people in the store. You are not loud. You are not fighting with your sister. You are not so absorbed in what you’re doing that you get in someone else’s way. You act in a way that makes people tell your mom what a nice child she has. Too often we think about what we want - no matter how that makes someone else feel. If we put ourselves first in everything we do, we don’t bring glory and honor to God. But when you are kind and respectful, obedient to your parent and nice to your siblings, people notice - and they might wonder why you are not like other people who think only of themselves. You just might get the opportunity to tell them that you do what you do because you believe in God, that you believe God has standards for conduct; God cares how we act and treat one another. Here’s the bottom line: the blooming flowers each spring give glory to the One who made them because they’re doing what God designed them to do. We were created to give glory to God. How well do you do that with your actions? Have you ever looked into a kaleidoscope? The mirrors and bright colors make a shifting, symmetrical pattern which is pleasing to the eye. So many times after looking into a kaleidoscope, you can go outside and see those same symmetrical patterns in the flowers. In reality the kaleidoscope is a pale shadow the God’s creation! Its intricacies are minor compared with the incredible details in God’s creation. Similarly, it’s fun to play with puzzles and figure out how everything fits into place perfectly. The old joke, when putting together a jigsaw puzzle, is that if a piece doesn’t fit, I’ll just take out my pocket knife and make it fit. And, of course, the reason that’s funny is because then you’d be left with the real piece which wouldn’t fit anywhere else. * Your nose can remember 50,000 different scents. * Your eyes are always the same size from birth (but your nose and ears never stop growing). * The largest internal organ is the small intestine. * Sneezes regularly exceed 100 mph & nerve impulses to and from the brain travel as fast as 170 miles per hour. *It takes 17 muscles to smile and 43 to frown. * A single hair can hold the weight of a hanging apple. However, scientists don’t specify the dimensions of the apple. * The number of bacteria in a person’s mouth is equal to the number of people living on Earth, or even more. * Over the course of just one day, our blood ’runs’ the distance of 12,000 miles. * A human makes approximately 20,000 breaths per day. Another example is your heart. When your heart beats, it sends blood throughout every part of your body. It sends the blood to the kidneys to clean out all the wastes. It sends blood to the cells in the muscles to give them nutrients and oxygen. The heart send the blood to the lungs to get rid of carbon dioxide and to pick up fresh oxygen for your body to use. But did you know that in a baby’s heart - before it’s born - the blood doesn’t go to the lungs? There wouldn’t be any oxygen to get because the baby is inside its mom - suspended in liquid. So a very cool thing happens: Before the baby is born, there’s a passageway in the heart that completely bypasses the lungs. The heart receives the blood and sends it back to the body. But as soon as the baby is born, that passageway closes, never to be used again, and the blood comes to the heart, goes to the lungs for oxygen, comes back to the heart, and then goes to the body. Who could ever have imagined such a cool design?!! Well, God did. After all, He’s the One who designed it to work that way! So the next time you sneeze, or you smile, or you smell something, or you feel your heart beating, remember to praise God your Creator, for you are fearfully and wonderfully made. Have you ever tried to stand in a very strong wind? Wyoming is renown for its wind, and the rim of the Grand Canyon gets some pretty strong wind at times. Not only is it hard to walk against the wind, it’s also very difficult to maintain your position. The wind seems to take it as a personal challenge to move you from your spot. Likewise, there are forces in this life which try to knock you off your feet and keep you from standing firm. So the apostle Paul wrote to the Ephesians and told them (and us) to put on the full armor of God so that we can stand, so that we can hold our position. The first piece of the armor of God is the belt of truth. Employing an effective visual aid, Paul emphasizes the necessity of speaking the truth. He says that part of the amor is a belt. What does a belt do? It’s really more than just decoration. For a soldier, it is that piece of armor from which you hang your weapons. Your hands and arms would get very tired of carrying weapons, whereas you can carry that weight around your waist for a much longer time. So think about truth being the anchor which holds your weapons close to you so you can use them. If you don’t have truth, you can’t carry your weapons very far; you can’t fight as long. There’s another interesting analogy for the belt of truth. A belt holds your pants up! Think about it: if you don’t wear a belt, then your pants fall down. You’re exposed. You’re embarrassed. You’re vulnerable to attack because you’re trying to cover yourself up! The belt of truth keeps us covered from Satan’s falsehood attacks. If you know what the truth is, it helps you to discern the lies. Don’t ever get sucked into the idea that a little lie doesn’t matter. If it’s not true, then it’s a lie. Wear the belt of truth. The second piece of the armor of God is the breastplate of righteousness. First of all, what is righteousness. Ness is the state of being; ous means full of; so righteousness is the state of being full of right actions, doing what is right according to God. That’s significant. Righteousness is not defined by what we think; righteousness is determined and defined by God. He gets to make the rules; He’s God! So Paul again uses the visual to drive home the point. A breastplate protects your vital organs, in spiritual terms, your heart. When you do right actions, you are protecting your soul. If you’re having trouble thinking of what that might look like, think of the opposite. If you do a wrong action, how does it make you feel? Do you get sick? Does it make you feel bad? Do you get irritable with the people around you? Does it make your stomach hurt? Your wrong actions, your sin, caused you to take off that breastplate of righteousness. Your sick feeling is a direct result of not doing what you knew you should have. And furthermore, if you don’t get that breastplate back on again (by repenting and going back to God for His forgiveness and direction), then you are leaving yourself open to more attacks by Satan. Satan is like a roaring lion, looking for someone to devour (1 Peter 5:8). Ephesians 6:11 tells us that the armor is so that we can defeat the schemes of Satan. Why in the world would you want to leave yourself open to attack by the being who wants to destroy you and destroy the relationship you have with God? Put on the belt of truth. Wear the breastplate of righteousness. Leave no opportunity for the schemes and plans of the devil. What’s the first thing Mom says when it’s time to go somewhere? “Get your shoes on; let’s go!” And it makes a difference what shoes you wear. If you’re going to go hiking, it would be best to put on hiking shoes. If you’re going to be mucking out the horse stall, it would be best to have waterproof muck boots. If you’re going to be playing at the creek, it’s nice to have water shoes or old tennis shoes. But it doesn’t work very well to wear flip flops if you’re tromping through the woods in 40º weather collecting firewood. And it doesn’t make any sense to wear heavy snow boots if you’re going to play on the beach in 80º weather. You have to have the right shoes for whatever job you have to do. Some people say that the shoes are the peace or the gospel of peace. But Paul doesn’t say that. He says that we put on readiness - the state of being ready - and that readiness is given by the gospel of peace. It is the good news that Jesus Christ has come as our Savior, to redeem us from unrighteousness, to save us from the penalty of our sin. It is the good news that Jesus has reconciled us to the Father through His blood. It is the good news that we belong to God, that He cares about us, that our lives are in His hands. Psalm 119:165 says, “Great peace have they who love God’s law and nothing can make them stumble.” When you know that gospel of peace, that good news that Jesus has saved you, you also know that God has provided a lamp to your feet and a light to your path so you won’t stumble. God’s law teaches you how to be ready to go do the task God has given you to do. If you know that good news, those promises of God, then you are ready to stand against the devil’s plans. Have you put on the readiness that is given by the gospel of peace? Have you ever played with a jack-in-the-box? You are busy turning the handle, thinking the music is a little weird. Suddenly, this clown guy pops out! (No wonder there are so many people traumatized by the recent clown sightings; it all goes back to playing with a jack-in-the-box when they were little! ) For a little child who has never seen a jack-in-the-box before, it can be very scary. They don’t know what to expect and suddenly there’s an unexpected movement. They weren’t ready and they are often startled - and maybe they start to cry. Life is kind of like a jack-in-the-box. You walk through life, minding your own business, maybe enjoying what you’re doing, or maybe you’re a little bored. Suddenly, something totally unexpected happens in your life. Sometimes those unexpected things are scary - like a tire blowing out when you’re traveling somewhere, or a deer jumping out in front of the car! Sometimes it’s a good thing - even if it’s unexpected - like getting a call that you’ve won a contest or that you’re going to have a new little brother or sister. There are other unexpected bad things too: The apostle Paul calls them the flaming darts of the evil one. Satan will try to hurt you in any way he can. He knows that doing something that is unexpected is more likely to hurt than if you’re ready for him. So Paul tells us to put on the shield of faith. O.K. So when would you want to have your shield of faith? Any time that you want to be protected from the fiery darts of the evil one!!! When you first get up in the morning, you put on your clothes. Why wouldn’t you also put on the belt of truth - committing yourself to being truthful all day?! Why wouldn’t you put on the breastplate of righteousness - purposefully determining that you’re going to do what is right, even when it’s hard?! You know you have to put on your shoes so you can go where God wants you to go - being ready because you know the gospel of peace. In the same way, you need to take your shield of faith with you all the time. It’s part of what you clothe yourself with every day. What is the shield of faith? Where do you get it? Your first measure of faith comes from God. But you want your faith to grow stronger - and that happens when you spend more time with God, coming to know who He is and how much He loves you. When you learn to trust Him, when you believe His promises, when you live your life knowing He has your best interest at heart, you’re growing your faith. As your faith grows, you have a stronger shield to extinguish the fiery darts of the evil one. But if you don’t spend time with God and grow your faith, what will you do when Satan shoots fiery darts at you? Put on your shield of faith every day and in every circumstance! If I want protection from a dangerous enemy, what am I going to put on my head? A sunbonnet or a helmet? The sunbonnet will provide protection from the sun, but it’s not the defense that a helmet is against almost any other weapon! A helmet can defend against sun, but it can also defend against hail or arrows or swords or tree branches. You see, your enemy, the devil, will use whatever weapon he can to harm you. You need to wear the head gear which will give you the greatest protection. So put the helmet of salvation on your head! Don’t leave your head unprotected! The other piece of the armor of God in this verse is the sword of the Spirit. The apostle Paul is very clear: this is the word of God. So think about a dull table knife compared with a sharp knife. Which one will cut bread - not smash bread, but cut it? Which one will carve a turkey? Which one will cut steak? Obviously, you want a very sharp knife to make a clean division between two pieces. Think about it: you can actually get more hurt using a dull knife because you’re forcing it to do something it can’t. Similarly, since the sword of the Spirit is the word of God, you want that sword to be very sharp. That happens when you do a couple of things: you ask God for His wisdom and you read the word of God, studying God’s word to know exactly what God has said. The more you study with the Holy Spirit leading you into all truth (John 16:13), the sharper your sword becomes. When your sword is sharp, you walk in the way that pleasing to God. Psalm 119:11 says, “I have stored up your word in my heart, that I might not sin against you.” But when your sword is dull, then you don’t know when someone is trying to deceive you and pull you away from God’s way. You can’t easily divide between truth and lies. The dull sword can really hurt you! When you put on the full armor of God, don’t forget your helmet of salvation and make sure you have a sharp sword of the Spirit, the word of God. What is the purpose of the armor of God? The apostle Paul says it is so that we can stand against the schemes of the devil. Make no mistake, the schemes the devil has against you are not for your good. Rather, they are schemes for your hurt, for your alienation from God, for your ultimate destruction. You want to be protected. Where does our faith come from? Hebrews 12:2 says that Jesus is the author and the perfecter, or finisher, of our faith. Our faith initially comes from Him, and He takes it until it’s completed. Who is our salvation? The very name Jesus means “salvation.” Psalm 118:21 says, “I thank you that you have answered me and have become my salvation.” In context, this is Jesus Christ. Interestingly, this is the last of the psalms called the Hallels, sung at the end of the Passover. So when you are putting on the full armor of God, you are putting on Jesus Christ. If you ever wondered what it means to put on Jesus Christ, the apostle Paul gives us the description. You are always truthful. You always choose God’s way, the right way, to live. You are ready to share the gospel of Jesus Christ with the people around you. You live in faith, trusting God with your life. You live your life knowing that Jesus is your Savior; there is no other name under heaven by which we can be saved! And you study your Bible daily to stay sharp, to know what is truth and what is lies. Next week, we’re going to talk about another cool object lesson from God about putting on Jesus Christ, becoming like Him. Materials: Little things to count, counting books (My favorite is Doggies by Sandra Boynton), calendars for the next seven weeks, tiny stickers to mark of the days. We count things all the time: the days until school’s out, the number of biology assignments left in the year, the of inches you’ve grown in the past month, how many forks we need for supper tonight, how many dogs are in the house . . . Since counting is a basic math concept that must be mastered before learning addition and subtraction, we start teaching children how to count when they are still very little. And when you’re learning a new language, that’s one of the first things you learn, regardless of your age, how to count in that language - French, Spanish, ASL, all of them. So here’s a very interesting verse in Leviticus 23:15: You shall count off seven full week from the day after the Sabbath. God tells us to count . . . from the day after the sabbath, and generally we do that from the sabbath in the middle of the days of unleavened bread. Do you know why we count from the day after that particular sabbath? It’s the wave sheaf day - the day when the first grain that was harvested from the barley is waved before the Lord. It’s recognition - at the very beginning of the harvest - that He is the Lord of the harvest (Matthew 9:38): He has given us the grain to plant; He has given us the land to plant it in; He has given us the rain; He has caused the grain to grow and produce more grain. It all comes from Him. But there’s something else very special that happened on the Wave Sheaf Day the year that Jesus died: Jesus rose from the dead, as the wave sheaf offering to God - the very first of the firstfruits (1 Corinthians 15:20, 23). Because Jesus rose from the dead, He makes it possible for us also be to raised from the dead (Romans 6:4). As the wave sheaf offering (John 20:17), Jesus is the recognition that our salvation, redemption, acceptance before the Father is all God’s work (1Corinthians 1:30). We are God’s workmanship (Ephesians 2:10) and the firstfruits of the harvest in Jesus Christ (James 1:18). But the Wave Sheaf Day is not the end of the count. We’re told to count seven full weeks. O.K. How many days are there in a week? Seven. How many days are there in seven full weeks? 49. So we count off 49 days and the 50th day is the next of God’s holy days - the Feast of Weeks or Pentecost. The counting of these seven weeks must be very important. God told us to do it. It’s much too easy to let the days slide by without counting. Make sure you count! We’ve all had times we wished our reach was a little longer. Maybe there’s something on a high shelf you need. Maybe you dropped something important behind the couch and you cant quite grab it. I bet Chloe and Cabella know how important it is to put things up and out of Elijah’s reach sometimes. And I bet Cayla knows how important it is to put things out of Chloe and Cabella’s reach sometimes. But obviously, it’s a common problem because they mass produce claws and extensions to help. So, is that what this verse is talking about? Is Isaiah saying that that God can reach anything He wants, no matter how far away it is? While it’s true that all things are in God’s control, Isaiah is getting at something a little deeper. So, tell me the verse again. It’s like this ball. I could be going down the right path, following God (roll the ball across the table in a straight line) then oops! I start sinning. I get off the path. And pretty soon, (roll the ball off the table) I face the consequences. That ball can’t roll itself back up onto the table, can it? It’s depending on sometime to pick it up and put it back on the table. In the same way, once we get off the path, we need God to grab us and get us back on His path. Now, could one of you have grabbed the ball before it fell off the table? Yes. And sometimes God stops us when we go off the path. Sometimes He intervenes and keeps us from making a bad choice. But sometimes He lets us feel the consequences of our actions. That’s not very fun, is it? The good news is that God is always there when we realize our sin and repent. If we turn and ask for God’s forgiveness, He will always forgive us and help us back onto His path. Just like in the story of the prodigal son, God’s arms are always wide open to receive his returning children. His arm is in no way shortened. A couple of weeks ago we talked about counting - specifically because we’re counting from the Wave Sheaf Day until Pentecost. Do you know why we’re counting? The first reason is because God said so. . . . So how are you doing on your count to Pentecost? Do you know what day of the count today is? Are you using the calendar and stickers? Are you learning anything while you’re counting? As we count the days to Pentecost, it makes us start thinking about why God might want us to do that. The psalmist who wrote, “So teach us to number our days” went on to say “that I might gain a heart of wisdom.” Counting the days can make us wise. Hmmm. What kind of wisdom is this, do you think? Is it wisdom that you get from the world? Maybe. But it’s more likely that the wisdom you get from counting your days is Godly wisdom. How would that work? I have another question for you too: what do you think I did yesterday? I picked the first of the strawberries. I had picked a small container on Wednesday, but Friday was the first good harvest of strawberries. But what does that have to do with counting or numbering our days? One of the lessons we learn from numbering our days is that we only have so many. We don’t want to waste any of the time that God has given to us. Wasting time means that we’re not doing something that is profitable for the kingdom or something that doesn’t bring glory and honor to God. We want to be productive, or fruitful, servants for our King. But how does that relate to strawberries? Well, in order to get a harvest of strawberries, I had to work. There’s weeding. There’s watering. There’s weeding. There’s mulching. There’s weeding. . . You get the picture. If I don’t work hard to make the plants productive, I’m not going to get a very good harvest; there won’t be many strawberries to eat. It’s the same thing with you. How do you become a productive, fruitful servant of God? You have to work at it. There’s Bible study. There’s prayer. There’s going to church. There’s Bible study. There’s prayer. . . You get the picture. If you don’t work hard to build your relationship with God, you won’t be productive. There won’t be a very good harvest of Godly actions which glorify God. Being a faithful, productive, fruitful servant for our God means intentional work on your part. You have to make God the priority in your life. That means doing what He says - not some of what He says, all of what God says. He’s God. He has the right. And right now, what are you supposed to be doing? Counting. We’d better get to it! Materials: predetermined activities (one for each child) - 1) count from 1-25; 2) say your abcs; 3) name 10 animals you’d find at the zoo; 4) list 10 different colors; 5) name your 10 favorite things to eat; 6) name your 10 most favorite toys; 7) list the names of 10 songs or hymns, etc. If I gave you a job to do, one that you knew how to do, how hard would it be to do it? It depends, doesn’t it? What if there’s lots of noise in the room? What if there are other people doing their jobs and distracting you from your task? What if people are watching you, you feel embarrassed and forget how to do your job? You may have the skills and the knowledge to do the job I gave you, but getting it done could prove to be a challenge. Isn’t that what it’s like as a Christian who is seeking God? We know that God is the most important Being in the universe. We know that He’s Sovereign. We know that He’s not going to give us more than we can do. We know that He’ll give us the tools to complete the job before us. But we can get really distracted. There are other people! Each of them have their own job to do. Their job may not look like your job. You can’t worry about what they’re doing. You have your job in front of you. You can’t get distracted because their job is interesting, or because they’re loud, or because you think God gave you the wrong job. You want theirs. God gave you a specific job to do. You can’t let your heart wander from that task. Someone might tell you that you’re doing your job wrong. But you know what God has told you to do. You can’t look at the way they do their job and decide to ignore what God says. If it’s a contest between following someone else and following God, God wins hands down. You keep your heart and mind focused on doing your job the way God says to. You might be afraid that someone will laugh at you because you’re different, that you’ve got a different job. But your job comes from the greatest Being in the universe. You serve God. You don’t worry about other people and their noise. You seek to please God with all of your heart - doing your job for His pleasure. There’s lots going on in our world. People are doing all kinds of things - and causing a lot of distractions while they do those things. You have to seek God with all of your heart, do the job He gave you to do, and not let yourself wander from doing His commandments, what He says to do. One of the things that Jesus prayed about His disciples to His Father that last night before He died was this: I have given them your word, and the world has hated them because they are not of the world, just as I am not of the world (John 17:14). Here’s what that looks like. (Pour water into a jar.) The water represents the world. But we are not of this world. In John’s words, we don’t love the world or the things in the world. In terms of water and oil (Pour oil into the jar with the water), they don’t mix. Jesus went on to pray to His Father, I do not ask that you take them out of the world, but that you keep them from the evil one (John 17:15). I think that Jesus knew that Christians would not feel at home in this world. We feel like we don’t belong. Because we’re Christians, we want to do what pleases God . . . and there’s way too much sin in the world and in the things of the world for us to want to be part of it. (Pour in red food coloring.) The red food coloring represents sin. Where does it go? It goes through the oil and doesn’t stick. It goes straight to the water. When Christians are seeking God and trying to follow His ways, God keeps us from the evil one, from Satan, and his schemes to deceive us and cause us to sin. Just like the food coloring doesn’t stick to the oil, sin doesn’t stick to us. We live in this world, but we don’t have to sin just because we live here. Of course, occasionally we do sin. (Stir the jar with the spoon.) When that happens, we look just like the world. No one can tell the difference between who is a Christian and who is not because sin is right there with us. That’s sad. So what do we do? We repent, telling God that we’re sorry and that we’re not going to disobey Him (called sin) again. It might take a little while for us to reclaim our reputation with the people around us. They want to see that we are truly different than all other people in the world who don’t love God. But eventually, just as it takes some time for the oil and water to separate in the jar, eventually we are again distinct from unbelievers. Let me put it a different way: When we are following this command to not love the world or anything in the world, we can let the light of God shine through our lives to the people around us. That is, we’re a good witness for Jesus Christ. (Shine the flashlight through the jar.) Notice that the light doesn’t shine through the water contaminated with food coloring any better than God’s light shines through someone’s life completely contaminated with sin. But see how the light can shine through the oil? Without sin impeding the light beams, God’s light - His ways, His goodness, and His love - can shine through the life of a Christian. John says, Do not love the world or the things in the world. If anyone loves the world, the love of the Father is not in him. We not only want the love of the Father in us, we want others to see the love of God shining in our lives. That’s why we separate ourselves from the world and the things in the world that are not Godly. People rarely wake up in the morning and think, “I think I’ll sin today. I feel like being completely disobedient to what I know is going to please my God.” Instead, we often sin when we’re under pressure. We have to make a decision quickly and we make the wrong one. Sometimes the pressure comes with emotions, like anger. Someone says something and we respond quickly, in anger, saying something we should never have said. Sometimes the pressure comes with another emotion: hurt. Someone says something that hurts us deeply and we respond quickly, in hurt, saying something very hurtful. Sometimes the pressure comes with another emotion: fear. We are afraid of what someone will think of us, so we lie. Or we’re afraid that we’ll get into trouble if they learn the truth, so we lie. Or we’re afraid that we’ll lose that friendship, so we lie. Sometimes the pressure comes from our own desires. For instance, Mom says, “Don’t eat any of those freshly baked cookies until after supper.” But then she leaves the room for a minute, and they smell so good, and you succumb to the pressure and take just one. But it’s still sin because you’ve not honored your mother; you’ve completely disobeyed her. There are lots of ways that we can find ourselves having sinned, in word or in action. And many times it’s because we didn’t take the time to think about our options. We react too quickly. We respond to pressure (or stress) and jump . . . right out of relationship with God because we’ve sinned. In the end, it’s best to stay as far away from temptation and sinning as possible (aka keeping the balloon from popping). But sometimes you find yourself in a situation where you weren’t expecting the temptation. Take some time to stop, pray for God’s wisdom and power, and then slowly make your move. Avoid making quick decisions when you feel pressure or are stressed. Materials: a jar of M-n-Ms.
God uses the things in this world to teach us about Him. And although I’m not sure God intended us to use M-n-Ms, there’s three things about these little candies which are also true about the body of Christ, the Church. First, there’s a mark on the outside of M-n-Ms. That’s how you know it’s an M-n-M and not a Skittle or some prescription medicine. Can you tell who is a Christian by looking at them? Is there a mark on them? If you lined Christians up next to unbelievers, you might be able to tell that they are Christians by the things they wear, what’s displayed on their body (like body piercings and hair color), and their facial expressions. But you’d be better able to tell by their actions. At least, certain actions would definitely lead you to believe that they aren’t Christians. Other actions would be a strong indicator that they are in the body of Christ, the Church. Secondly, notice how the M-n-Ms are all different colors? Similarly, believers in the body of Christ don’t all look the same. We have different jobs. We have different gifts and talents. We have different likes and dislikes. And that’s okay. In fact, it’s God’s plan that we would all come together with different gifts and talents and jobs just like the human body. A nose doesn’t walk you across the living room floor. Your knee doesn’t keep a look out for toys to avoid when your feet and legs walk you across the floor. Your ears don’t have the same job as your nose or your eyes. But just like the different parts of the body come together, working together, to accomplish God’s purpose, so we all - as the body of Christ - all work together with our individual jobs and talents to accomplish God’s purpose. Third, all of the M-n-Ms may look different on the outside, but inside is chocolate! Similarly, although Christians look different, inside is the love of God. If they truly are Christians, they will be filled with the love of God and their actions will flow from that reality! I don’t know that God ever intended us to use M-n-Ms as something which would remind us of His presence in our lives, but they are a yummy reminder every time we eat one. What do you get when you first plant your garden? What is the first thing you harvest? Ask my kids! I’ve been making them help me harvest every morning for an hour! Weeds! Now obviously, weeds really aren’t part of the garden harvest, but they are very ubiquitous. It’s an amazing thing how the weeds flourish better than the plants you tend and nurture and really want to grow! So I spend hours weeding and watering and mulching with hay around my plants. If I leave the weeds, they’ll choke out the tender tomatoes and carrots and strawberries. If I don’t water enough (not too little, not too much), the weeds will survive, but the chard and broccoli and peppers will not grow well. And they might not even make it. And I have discovered that if I put hay around my plants, it keeps down the weeds and it also moderates both the water and the temperature. The plants don’t get too dry or too wet, nor do they get too hot in the Missouri summer sun. And isn’t my garden like the life of a Christian!? When you’re a new Christian, what is most likely to show up in your words and actions? Weeds - things that are not Godly, things that are not pleasing to God! So you work to get rid of those weeds. That happens both by your will and God’s Holy Spirit working in your life. But remember: it’s not just weeds that keep the garden from growing well. It’s also water. And I don’t think it’s a coincidence that Jesus said, “If you knew the gift of God and who it is that asks you for a drink, you would have asked him and he would have given you living water.” (John 4:10). God has made it very plain in our lives that we can’t survive as a Christian unless we have a relationship with Jesus, the One who can give us the Living Water, the Holy Spirit (John 7:39). In the end, if you make good choices and stay connected to God the Father through Jesus Christ, there will be an abundant harvest in your life. You’ll be exhibiting the Godly behaviors that draw others to want a relationship with God. That’s when you become a laborer in God’s harvest - willing and able to spread the good news of Jesus Christ to a world - a field - that so desperately needs Him. So when you are praying that the Lord of the harvest will send more laborers into the harvest, it’s important to remember that you’re one of those laborers - but you’ve got to keep the weeds out of your garden and you have to have the Living Water, the Holy Spirit. And we’ll talk more about that tomorrow, on Pentecost. How do these flashlights work? They have to have a power source - a source that is not part, exactly, of the flashlight. There’s a battery inside that flashlight which provides the energy, the power, to shine the light. It’s an interesting analogy. You see, people think that they have power. They can do great things. There are contests and awards to celebrate great feats. Knowing that our great God is so incredibly powerful, what do you think the disciples thought when Jesus said, “And behold, I am sending the promise of my Father upon you. But stay in the city until you are clothed with power from on high.” This was after Jesus’ death and resurrection. The disciples had just seen a phenomenal display of God’s power. Now Jesus was telling them that they would be clothed with power from on high. Yesterday we talked about the Living Water (which John 7:39 says is the Holy Spirit). Water is what gives life to all things. Where there is no water, there is no life. But here’s another picture of the Holy Spirit. In Acts 2:1-3, the disciples heard a mighty rushing wind. Then they saw what seemed to be tongues of fire which separated and came to rest upon each of them. Then they were filled with the Holy Spirit, which enabled them to speak in tongues. Being filled with the Holy Spirit, the disciples now had an ability that they had not had before. They had power from on high. Pentecost is the memorial of that day, the empowerment of the Church, when 3000 people were baptized and filled with the Holy Spirit (Acts 2:41). The little flashlight is very much like what happens to believers. We live in this physical body. We can do some things. But to shine the light of Jesus Christ to people around us, to have the power to live lives which glorify God, we must have the Holy Spirit living in us - just like the flashlight can’t shine unless it has the battery inside it. We can’t buy this power of the Holy Spirit. We can’t earn this power. It only comes from having a close relationship with Jesus Christ. The Day of Pentecost is a truly great Holy Day, one in which we celebrate the pouring out of God’s Holy Spirit, His power, on those who believe in Him. Let’s use bowls and ice cream and salt to talk about Proverbs 11:3. “The integrity of the upright guides them” - If you are honest and try to do the right thing, your life will show that, and you will be blessed. “But the crookedness of the treacherous destroys them” - if you try to deceive people, you make a habit of doing wrong things and making bad choices, ungodly choices, you will not be pleasing to God, and in the end, you won’t be in His kingdom. Would you ever compare your life to a bowl of ice cream? Well, you could. Mostly life is good and we enjoy it. But sometimes we make mistakes or bad choices - kind of like when you sprinkle salt over the top of your ice cream. Knowing that there’s salt on your ice cream, would you eat it? Would you serve your mistake to someone else, someone unsuspecting? Do you have integrity (honesty) or are you treacherous (devious)? So sometimes people try to cover up their mistakes by lying (and that’s crooked according to God) - kind of like when you cover the salted ice cream with chocolate syrup. The chocolate syrup will cover the salt, but the salt’s still there. Maybe no one will notice. Would you eat the mistake now? Would you serve it to an unsuspecting friend? The salt has tainted the ice cream just like lying taints your life. So do you cover up your mistakes with lies? If you cover up your mistake with lies, are you living honestly or treacherously? Or would you try to fix your mistake? We could try to scrape off the top layer of ice cream, but what a waste of good ice cream. And isn’t life like that? Sometimes when we try to fix a mistake, it’s painful, even if it’s necessary. Fixing a mistake is part of living an honest life, a life of integrity. But what if you have made a habit of that mistake? What if the salt is so caked on to the bowl that you can hardly scrape it off? What if you have made bad choices so long that they are caked on like layers of dried salt on a bowl? The good news for you is that Jesus can change you. Jesus can forgive you when you make a bad choice, and He can help you choose better next time. But you have to pray to Him and ask for His forgiveness. You really have to be sorry. And that’s kind of like what happens with the salt-encrusted bowl. The water washes the salt away. Praise God that He has made a way for all of us to move from the classification of treacherous and crooked to the classification (in Christ) of honest and full of integrity! You can learn some very important principles by considering a pencil. First of all, in order for it to be useful, it has to be guided. Most people use their hand to guide the pencil to write. But some people use their mouth (Joni Erickson Tada) or their feet. What guides you in your life? When you’re little, your parents guide you. They direct you, teach you, what is right and wrong, what will hurt you and what will help you. They show you how to do things. They teach you what you need to know in order to succeed. But how do your parents know how to teach you? Many times moms and dads teach their children the way they were taught. If your mom was taught to ask to be excused from the table, she’s likely to teach you the same manners. If your dad was taught to listen when other people are speaking, he is likely to teach you the same courteous behavior. And if the moms and dads are Christians, if they truly love God, they are likely to ask God for help, for wisdom, for guidance in teaching the children God has given to them. Because moms and dads love their kids so much and want the very best for them, their prayers are full of requests to God for help. But Solomon says that it’s more than just asking for help. Solomon says, “In all thy ways acknowledge him, and he shall direct thy paths” (Proverbs 3:6, KJV). This is more than just asking for help or wisdom or direction sometimes. This is turning over every area of your life to God, where God is the foundation of everything you do, and then relying on God to show you how to live your life. It’s very much like this pencil. This pencil can do nothing until I pick it up. Whether I put the point to the paper to write, or I put it down because I’m done writing, the pencil does nothing that is not what I want it to do. Now the pencil has no choice in the matter. But you do. You can choose to live your life seeking God’s will, doing everything for His glory and pleasure. And in order to know what pleases God, you have to be reading His Word and praying to God and talking to other people who love God. Are you moving at the direction of God’s will in all areas in your life? Be like a pencil - doing all things at the will of the Master. It’s amazing what you can learn from a pencil, and I don’t mean because of what it has written on your paper. Last week we talked about how a pencil must be guided by a hand in order to be useful. Similarly, we must be guided by God’s hand in order to be useful to Him. But what if my pencil isn’t sharp? Is it still useful? Not as a pencil. Not really as an implement to convey knowledge. You could use the eraser, if it had one. You might be able to make some sort of marking. But really, if a pencil is going to transmit knowledge efficiently and effectively, it has to be sharp. In the same way, as the people of God, if we aren’t sharp, our usefulness to God is limited. What do I mean by that? God gave us a job - to spread the gospel of the good news of Jesus Christ. But what if we don’t know what that means? What if we don’t know anything about God - or at least not enough to be able to tell others about what an awesome God we serve? What if we don’t know what God expects from His people? What if we aren’t sharp? If a pencil isn’t sharp, we can put it in the pencil sharpener. But a “sharp” pencil isn’t the same kind of “sharp” as a “sharp” person. It doesn’t work to put a Christian in a pencil sharpener. But it does work really well to put a Christian in a Christian sharpener. That’s where the memory verse comes in: Iron sharpens iron, and one man sharpens another (Proverbs 27:17). Have you ever seen how a knife is sharpened? You can use a whet stone. Or you can use a steel. Both of them are knife sharpeners. How well do you think it would work to hit the knife at a 90º angle against the steel? Hopefully you can see how that would not only make the knife less sharp, it could also irreparably damage the knife. You hold the knife at an angle to the steel. The steel little by little takes off some of the blade, the burrs, until there is an edge on the knife, a focused edge, a very sharp blade. That’s how it works with Christians. As we talk with one another, using the Bible as our guide and final authority, we take off the burrs until we have a very focused edge. God uses each of us to help make one another sharper - and therefore, stronger - as Christians. Then we are of much greater use to His glory. You know, there are some pencils that I don’t use because they aren’t sharp. There are some knives that I don’t use because they aren’t sharp. In fact, with both pencils and knives, when they are very sharp, they are functioning just like they were designed to function, and they are a delight to use. I wonder if God feels the same way about us. We want to be used by Him. If we are sharp, if we know what His Word, the Bible, says; if we are able to apply His Word in the situations around us, then we can be very useful to Him. Learn to talk with other people about God. Don’t just talk about your favorite toy, your favorite video game, your favorite movie, or your favorite potluck item. Talk about God. Be sharp for His glory. Do you ever make mistakes? That’s a silly question, isn’t it? We all make mistakes. Some are just poor decisions. Others are bad choices which are contrary to God’s ways. Those mistakes are called sins. Sometimes we make mistakes without realizing it. Sometimes we make mistakes because we just can’t help ourselves. Those are sins of weakness. A pencil can help us understand how this works. Have you ever added numbers together and written down the wrong answer? That’s a mistake that you made because you weren’t thinking, you were distracted, or you just don’t know your addition facts very well. Sins are like that. You can sin because you weren’t thinking, you were distracted, or you just don’t know God’s law very well. Think about your pencil again. Have you ever intended to write one thing but your fingers just didn’t form the letter or number correctly? That’s a mistake that you made out of weakness. Some sins are like that too. You know you shouldn’t do something, but you still make the wrong choice. The thing is: when you make a mistake out of weakness, you have to fix it. With the pencil, you use the eraser to wipe out that mistake and put something else in its place. The only thing is - sometimes you can’t completely erase the mark. You can still see some of the mistake that you made. Sin is like that. You can try to make things right, but there’s still evidence that you made a wrong choice. There’s another very curious thing about pencils. If a pencil is brand new, the eraser usually works pretty well. But when a pencil has been around for a while, the eraser gets harder and harder and less and less able to erase like it should. There are some things you can do to fix that. They kinda work. You can put your pencil in a plastic bag with a little bit of water. Sometimes that helps. Or you can use a cutting board and a big knife to cut the eraser in half. You don’t have as much eraser to use anymore, but at least you’ve taken off the part that is hard and unusable. It’s an interesting thing about people and the mistakes we make. When a mistake is fresh and new, it’s easier to rectify - to fix. That’s kind of like the new pencil. But when we get into the habit of sinning, pretty soon we get hardened to our mistakes. It isn’t as easy to change our behavior. But it’s important to realize that there are consequences for every mistake, for every sin. Romans 6:23 says that wages of sin is death. You are not getting away with doing anything against God’s law. However, God has made a way - through Jesus Christ - for us to be forgiven. When we acknowledge Jesus as Savior and God, He takes the penalty for our sin. Better than any eraser could wipe out the mistake, Jesus cleanses us from all unrighteousness. It’s something to think about the next time you use an eraser. We’ve talked about the different things you can learn about your relationship with God from a pencil. The pencil doesn’t work unless there’s a hand to guide it; Christians work best when they allow God to direct their lives. The pencil works best when it’s sharp; Christians fellowshipping with one another can learn more about God, His ways, and serving Him. The pencil comes with an eraser; Jesus Christ is the only One who can take away our sins. Today we’re going to talk about the lead - or more specifically, the graphite in the pencil. A pencil can look great on the outside. It can be different shapes, different colors, different sizes. But what really matters is how well it does the job it was designed for - writing, drawing, sketching. And that all depends on what’s inside: the graphite. It’s the same for a Christian. We all look different. We come in different shapes, with different hair color and eye color, big and small. But what really matters is what is inside, what is going on in your heart. Are you hard hearted? You are determined to go your way no matter what. Are you half-hearted? You will do what God says, but you don’t really want to. Are you broken-hearted, depressed or sorrowful? It’s okay to be sorry for past actions, but you can’t stay this way. Are you whole-hearted, committed to serving God with all that you are? You know when you look at a pencil, you can’t really tell how nice the graphite is. There are some pencils I just won’t use because I don’t like how they feel. There are other pencils that make writing a joy and I’d rather use them than a pen. It’s the same way with Christians: we all look differently on the outside. What we do demonstrates what’s on the inside. Our actions show who we really are and what’s important to us. I the LORD search the heart and test the mind. And sometimes we don’t even know who we really are until we see how we react in different situations. We never knew that we would act in a certain way when faced with that problem. In pencil terms, I hope you are good graphite. I hope what is inside of you is very usable and a joy to your Creator. I hope you are committed to serving Him with your whole heart. What is your favorite treat? Do you like fresh blueberries or strawberries? Chocolate? Candy? Don’t you love how sweet it tastes?! Did you know that if you put an ice cube in your mouth until you can hardly stand the coldness, and then immediately put your favorite treat on your tongue, you won’t be able to taste it? The ice is so cold that it numbs your tongue’s taste buds and you aren’t able to really taste. Did you know that the same thing can happen to people? We can get caught up in what we want, how we feel, and what’s happening to us. It’s like we’ve had ice applied to our hearts, and we have become numb to the people around us. We forget to think about the feelings, thoughts, and needs of people around us. Just like putting ice on your tongue can numb your taste, only thinking about yourself can numb your heart. That’s not a good thing. Our loving Heavenly Father never intended for His people to just think about themselves. Rather, God uses us to encourage and help other people. But if we are only thinking about ourselves, we won’t stop to think to help and encourage someone who really needs it. It could be someone in your church family. It could be someone in your immediate family. It could be a good friend. There could be someone right next to you who needs you to do something nice for them. The next time you taste your favorite treat (without the ice), I hope you’ll think about how to let people see your warm and loving heart. While that’s working, let’s talk about joy. What is joy? How can your joy be full? Joy is not exactly the same thing as happy. You can be happy about something that happens. You can be happy that something didn’t happen. Happiness tends to be tied to individual events. If you are usually happy, then you are a joyful person. You don’t always have to be happy to be a joyful person; you’re just happy most of the time. That’s what your default setting is. Do you know people like that? I do. There are people who are almost always upbeat. They are known to be cheerful and you rarely hear them complaining. Then there are people who are grouchy and ready to complain about everything. The grouchy guy can be happy at times, but you know he’s going to be grouchy again before you turn around. His happiness is an emotion that comes and goes, but he really isn’t joyful. So where does joy come from? Joy that lasts, joy that gives you strength to keep going even when bad things happen, joy that keeps you smiling even when things go wrong - that kind of joy comes from God. Notice what Jesus said in John 15:11: These things I have spoken to you, that my joy may be in you, and that your joy may be full. Jesus told his disciples (and all of us) about our relationship with Him, about preparing a place for us to be with Him, about eternal life in His kingdom, about what He was going to do so that we could be with Him. God’s plan in our life gives us a goal to fix our eyes on. We don’t let the light and momentary troubles get us down (2 Corinthians 4:17) because we know that God’s in control; He’s working it out; and because He loves us, we can trust that things will work out for our good. So what about this “pill”? Don’t you think it’s interesting that it didn’t expand until I poured water over it? Do you remember what water is a symbol for in the Bible? The Holy Spirit. So if I add water to the pill and it expands, what do you think having the Holy Spirit working in your life will do to your joy? Your joy will grow - or maybe like Jesus said, your joy may be full. Here’s another object lesson. I pulled almost all of the corn yesterday. There was a small, secondary ear on one of the stalks. Look at the kernels that formed. Why does it look like this? The corn either didn’t have enough nutrients to completely fill out the ear - or there wasn’t enough water. It’s the same thing in your life: If you don’t stay connected to the One who gives us and Who sustains us (God), and if you don’t have His Holy Spirit working in your life, God’s joy will not be in you and your joy will not be full. So where you do get joy? The word that “joy” comes from is “rejoice.” Rejoice is an action - it is a celebration, an expression of praise and thanksgiving to God for what He has done in our lives. As you rejoice before God, the joy in your life becomes more and more full. You realize what God is doing, you focus on the good things He has done and that He promises to do, and your joy grows. Rejoice in the Lord always! Again I say, rejoice (Philippians 4:4). . . . . These things I have spoken to you, that my joy may be in you, and that your joy may be full (John 15:11). What do sponges do? Their name has become synonymous with soaking something up. In the physical case of a sponge, it’s liquid. If you’re talking about little kids, they soak up (and imitate) your words and actions. But once the liquid if soaked up, then what does the sponge do. It releases the liquid - just like someone who soaks up, and imitates you, will then turn around and do exactly what you were just doing. The Biblical word “tribulation” comes from a Latin word which means “to press” - like when you squeeze grapes to get the juice. So squeezing is going to happen. But what comes out? When a sponge is squeeze, what comes out is whatever was soaked up. Whatever is in you, good thoughts or bad thoughts; angry and hateful actions or kind and generous actions; love, joy, peace or hatred, discontent, and discord; that’s what comes out. So what determines whether we’re going to have good things or bad things in our thoughts and actions and words? Do you pick up negative thoughts or positive thoughts from others? Do you spend time around people who use good language or bad language? Do you watch tv and pick up attitudes and ideas that are God-honoring or which are not pleasing to God? Music. Movies. Books. Whatever it is that we fill our mind with is what we will display to others when we’re under pressure and what’s inside is squeezed out. But do you know that if you are filled with the peace of God, there’s not room in your life for discord. If you are filled with the joy of God, there’s not room in your life for discontent. If you are filled with the love of God, there’s not room for hatred. This is how it works. Look at the sponge soaking up the clear water. Once the sponge is full, if I put it in the container with colored water, there’s no room to soak up any more water. So how can we be so full of God’s peace that we won’t be upset and full of discord? Isaiah (26:3) says, “You keep him in perfect peace whose mind is stayed on you, because he trusts in you.” When you keep your mind on God - because you trust Him - you trust that He loves you, He’s got your best interest at heart, He’s working all things out for your good because you love Him, when you keep your mind on God, God keeps you in perfect peace. And when the pressure comes and you’re squeezed, the peace of God is what the people around you see. I want to be a sponge that soaks up God’s peace so much that that’s what people around me see when I’m squeezed. When I ask Pepper if he wants a treat, he is quite adamant that he wants it now - not ten days from now, not ten hours from now, not ten minutes from now, not ten seconds from now. Pepper wants that treat immediately. We’re not too different from Pepper. If I offer you something special, you want it right now. You don’t want to wait until after supper, or after you get home, or after potluck, or even after church. You want that something special now. But our world does not deal in everything you want happening right away. In fact, rarely do we get what we really want immediately. We don’t plant tomatoes and immediately pick the fruit. We don’t pick up a guitar and immediately play exquisitely. We don’t buy a puppy and immediately have a well-trained, well-behaved dog. We often have to wait for what we want: a ripe tomato, an accomplished guitar player, a well-behaved dog. The memory verse in Romans indicates that we also need to be patient when things are not going well, when we’re experiencing tribulation. That’s really hard! We find it hard to be patient when things are going smoothly. So when you are hurting, it’s really hard to be patient. But God has given us a couple of reminders to help. Did you notice where this admonition is? Be patient in tribulation is found sandwiched between two other admonitions: Rejoice in hope and be constant in prayer. We can be patient in tribulation when we know the suffering will not last forever. And we know the suffering will not last forever because we have hope in God. That is, when we love God and have a relationship with Him, we know God is in control of our lives. We know God will never give us more than we can endure. we know God has our best interest at heart. We know God loves us. Thus, the suffering will end. Sorrow may endure for a night, but joy comes in the morning. We can also be patient in tribulation because we always can talk to our Redeemer, our Savior, our Help in Ages Past. We know we can come boldly before the throne of grace in time of need. God will hear our prayers - when we have a relationship with Him, seeking to do His will. It doesn’t mean that our tribulation immediately disappears, but we know we can go to the only One who can help and He will hear us. So what does being patient look like? Is it whining about the situation and what you want? Well, think about it: you can be rejoicing and whining at the same time. So being patient doesn’t involve whining. Is it being agitated, anxious, and mentally jumping up and down in anticipation (like Pepper wanting a treat?) No! It’s waiting, calmly and with the assurance that demonstrates your faith in God. Being patient doesn’t come easily to any of us. Being patient in tribulation is even harder. But God gives us lots of opportunities to practice. And He gives us instructions. Rejoice in hope. Be constant in prayer. And maybe, just maybe we can learn to be patient in tribulation. If you had a travel-size container of toothpaste, could you squeeze all of the toothpaste out of the tube before the sand ran through the egg time? Sometimes this is how we live our lives. We feel like we have a job to do within a limited amount of time. So we jump in and we try to get the job done. But in the process, we are not careful about how we did the job. When you squeezed the toothpaste out, did it go all over the table? All over you? All over the floor? Sometimes when we’re in a hurry, we are not careful about how we accomplish our task. We are not careful about completing it accurately. We are not careful about completing it throughly. We are not careful about how we treat the people around us - because our whole goal is to get our job done. The egg timer reminds us of something else: once the time is gone, we can’t get it back. We will never get to decide how to spend this morning again. Yesterday is history and cannot be rewritten. Furthermore, the egg timer reminds us that our time is limited. We need to be careful of the time that we do have because we don’t have an unlimited amount. The toothpaste tube also teaches us something: once we’ve done something, we can’t undo it. When you squeeze all the toothpaste out, you can’t put it back. There are no erasers in the actions of life. There are no delete buttons. So we have to think very carefully about our actions. So what sort of actions should we work towards doing? How about the actions which glorify God, which demonstrate that we belong to God? Let’s start with love. Our God is love. And the apostle Paul tell us that love is patient and kind. We already talked about patient. What does it mean to be kind? When you are kind, you are not mean. You are not hurtful. You are not selfish. You do not treat everyone like you are more important than they are. When you are kind, you help other people. You encourage others. You say things that are true, but are also gentle and loving. We don’t have a lot of time in this life. And we don’t get to go back and live our days over again. So let’s strive to be loving, patient and kind. Materials: a hard-boiled egg, an apple, a small container of baking soda and one of vinegar, a clear container, a towel. How do you know if it’s a good apple or a bad apple? Sometimes there are spots where you suspect a worm might have crawled. Sometimes it’s kind of dented or wrinkly. But you can’t always judge an apple by its outside appearance. You might just get a bite that isn’t so appetizing, especially if you find half a worm. How do you know if this is a good egg or a bad egg? If you have a bowl of water, and it floats, it’s bad! But if you don’t have a bowl of water, you wouldn’t know until you crack it open. If it’s bad, watch out. It’s going to smell!! If it’s really, really bad, when you start to crack it, it will explode. And that’s very, very smelly . . . and messy! We talk about good apples and good eggs. But why are they good? Because they are still good to be used in some way - some way that usually involves eating them. So it’s not enough that the apple and the egg look nice on the outside. In our definition of good, we want to be able to eat them. I’d imagine you couldn’t begin to count the number of times your mom told you, “Be good.” Now did she mean that you should look nice on the outside? Or did she mean that your behavior should be good? Or that your thoughts should be good? In most cases, when your mom tells you to be good, she wants you to act in a certain way, to follow the rules, to stay out of trouble. We know what Mom means when she says, “Be good,” but in reality, Jesus said there is no one who is good, but God alone (Mark 10:18). So instead of telling us to be good, the apostle Paul tells all of us - adults and children alike - not to grow weary of doing good. Don’t you find it interesting that Paul has to say this? It indicates that it requires effort to do good. It requires perseverance. It might not always be your first choice. It’s hard. Our carnal minds would rather be bad sometimes because it appears to be so much more fun. But remember the bad egg and the bad apple? They are not very useful to the one who finds them, except maybe as fertilizer in the garden. In a similar way, if we are not dedicated to doing good, we’re not very useful to God. Now vinegar and baking soda are very good for a lot of different things. And together they make a wonderful reaction. But once they’ve combined and foamed, they’re not good for anything any more. Or are they? At first glance we might say that since the base-acid reaction is done, what’s left is just a mess and not good for anything. Sometimes we’re like the vinegar and baking soda. We see a job we can do and we’re very willing to do it. It certainly draws a lot of attention. But once that attention is gone, are we just done? If no one is watching us, are we still willing to do what is good and right? Are we willing to continue serving and doing good, even if no one acknowledges or appreciates us? The vinegar and baking soda combine to form carbonic acid and sodium acetate. Then almost immediately the carbonic acid breaks down in to carbon dioxide and water. The carbon dioxide escapes into the air. We are left with water and sodium acetate. The sodium acetate is what is commonly used to flavor salt and vinegar potato chips. Even when people don’t realize it, the vinegar and baking soda are still good for something. They are still useful. And even when no one around notices, we are very useful to God if we are willing to be used by Him. It may not look like we had envisioned. It might not even be fun. But Paul tells us not to become weary, or tired, of doing good. But we have to keep in mind that God put us on this earth for His glory. And when He puts something in our path to do, we need to do it with all of our heart, working as for the Lord, not for men. We should never grow tired of doing that - working for His glory. Faithful means being loyal, constant, or steadfast. It means being true to the facts or the original. So if you have a faithful friend, they will always treat you as a friend. They won’t make fun of you behind your back. They won’t act like they like you when you’re around, but talk badly about you when you’re not there. A faithful friend is loving and supportive all the time. So if you have a faithful dog, he follows you around. He protects you. He wants to be with you. He will go to great lengths to do what pleases you. He doesn’t bite you. He isn’t enticed by other people or things. He’s your dog and everyone knows it. If you have a movie that is faithful to the book it was based upon, it doesn’t change the storyline. It doesn’t introduce new characters. The movie turns out the same way the book ends. The movie is faithful to the original book, to the facts in the book. God is also faithful. He is constant and steadfast. He never changes. He is good. He is love. He is patient and long-suffering. And because God is faithful, you can absolutely depend upon God to always be this way. It should, then, come as no surprise that God rewards every man for his righteousness and his faithfulness. If you do what is right and you are steadfast in what you do, you please God - because God is righteous and faithful! So we know what it means to have a faithful friend, or a faithful dog, or a movie faithful to a book, but what does it mean for you to be faithful - in a way that pleases God? It means that when God tells you what to do, you make sure that’s what you do. It means that when you tell people you are a Christian, that you make sure you act like a Christian should act. If there’s a box on the table labeled “matches,” I would expect it to have matches in it. In order for it to be true to the fact of what it says, matches should be in it. If I find something other than matches in it, it was not faithful to what it said. In the same way, if you say that you are a Christian, what comes from you - your words and actions - should look Christian, according to God’s definition! Remember, the memory verse says that God rewards everyone for his or her righteousness and faithfulness. So think of the characteristics you have that are righteous, like honesty or helpfulness. If you are consistent in those characteristics, that’s pleasing to God. But how do you stay faithful to what God wants from you? You have choices every day. Are you going to be generous or selfish? Are you going to be loving or hateful? Are you going to tell the truth or a lie? Are you going to be obedient to your parents or disobedient? It’s like a transparency film over the paper. If it’s not a righteous choice, a Godly choice, a choice that pleases God, it doesn’t get written on the paper. If it’s a decision that is faithful to God’s ways, then you can write it on the paper. The reality is that sometimes we mess up. We make a wrong choice. We don’t act in a right way. We are not faithful to God. So we repent, telling God that we’re sorry, and then we try again. It can be discouraging to find out how many times we make a wrong choice. How many times did your mom have to scold you or punish you this week for making a choice that was not right, that was not faithful to God’s ways? If you are not happy with how often you were in trouble, you can always ask God for His help in making the right choices. It’s an extra help in choosing to put the transparency over the paper so that the wrong choices can’t get through. We have lots of choices to make in this life. Our goal is to make choices which are righteous and faithful to God, so that God will be pleased. what? What words could you use to describe how you have to build the card house? Maybe “careful.” Perhaps “deliberate.” Maybe “precise.” You also have to be very gentle. Gentle means treating something with care, as if it were very fragile or very precious to you. have to be very careful or gentle. If you hit a corner, the whole thing might collapse.. If you decide to drive through the house of cards, you have to be very, very gentle and precise and careful. Can you think of things you have to be very gentle with? Kittens, puppies, babies. could be ruined beyond repair. speak to someone else.” Think of how that definition works in this verse. In other words, the words that you choose to say to someone can either build them up or tear them down. You can speak gently and help someone, or you can be mean and cause irreparable damage. Think very carefully both about what actions you choose and what words you choose. You want your words and actions to be beneficial to others, to help them, to be good. You want to be gentle. We have sounds all around us. Sometimes they mean specific things. What if you hear “honk-honk” as you’re driving down the street? Usually that means, “GET OUT OF MY WAY! !” What if you hear, “ring, ring”? That used to mean, the phone’s ringing; answer it. (With all the ringtones available today, that doesn’t necessary hold true anymore.) But you know if you hear a siren, there’s danger somewhere. The police or the firemen or the ambulance is rushing to do their jobs. So in 1 Corinthians 15:52, Paul tells us that the trumpet will sound. Why is it sounding? We know that the trumpet was sounded at the beginning of the month. Hey! That’s today - the Feast of Trumpets!!! But there’s another reason the trumpet would sound on this day. Many people in God’s church believe that Jesus Christ will return on the Feast of Trumpets. So the trumpet blast does two things: it calls all of God’s people together - and it announces the advent of the King, the arrival of Jesus! Part of the reason that we believe the return of Jesus happens on this day, Trumpets, is because the actual name of the day is the Day of Shouting or the Day of Blowing. What would be blown? Likely a trumpet. So look at what 1 Thessalonians 4:16 (KJV) says: For the Lord himself shall descend from heaven with a shout, with the voice of the archangel, and with the trump of God: and the dead in Christ shall rise first. This is a day of celebration, a day of shouting and rejoicing, a day when we look forward to our King coming back! What a wonderful sound that will be!!! How can I get the ball into the jar without touching the ball? It’s a very “controlled” action. I have to hit the bowl just right, knocking it out of the way and allowing the ball to fall straight into the jar. If I tap the bowl, the ball just falls off the roll and the bowl just falls off the jar. Similarly, you can imagine what will happen if I hit the bowl really hard! The bowl and jar and ball will go flying! That doesn’t accomplish my goal either. But if I firmly hit the bowl, the bowl flies out of the way, allowing the ball to drop right into the jar. The degree to which I hit the bowl is analogous to my self-control. If I merely tap the bowl, it’s like being too lazy to put much effort into a task. Nothing much happens if you don’t put effort into a job. On the other end of the spectrum, if I really hit the bowl hard, sending everything flying, it’s like the man who has no self-control. He gets angry very quickly. He gets overly excited over little things. What does that look like? If I give you an envelope of stickers, you show little self-control if you stick them all over the walls, your Bible, your mom. It’s inappropriate behavior. It’s not right and it doesn’t end well. That’s like hitting the bowl too hard. But I can give you an envelope of stickers and ask you to make a picture with them. If you won’t even open the envelope, that’s like tapping the bowl. It isn’t anywhere close to accomplishing your goal. You don’t want either extreme. You don’t want to hit the bowl too soft or too hard. You don’t want to put stickers all over, but you do want to complete your job. It’s kind of like the story of “Goldilocks and the Three Bears,” isn’t it?! You want to be just right - not too hard, not too soft. You want to be self-controlled. Sin is the transgression of God’s law - and we all sin. We all fail to obey God perfectly all the time. So then what? Well, we either have to pay the penalty for our sin, or we have to find someone who can pay the penalty for us. The penalty for sin, the consequence of disobeying God, is death. And unfortunately for us, there’s only One Person who can pay that penalty for us: Jesus Christ. No other person can die in our place. No other person can be the proper payment for our sins. But Jesus’ payment for us goes beyond just paying for our sins; He also reconciles us to God. We are then restored to a position of relationship to the Father because of what Jesus did on our behalf. And yet, it’s more than payment and reconciliation. After Jesus died, He sat down at the right hand of the Father in heaven - and ever lives to make intercession for us. So when we sin, we know that we have an Advocate before the Father. Take a dry erase board. Write an example of a sin in permanent marker on the board. Once you’ve written it, you can’t erase it. It’s permanent ink. That’s what sin is like. Once you’ve committed a sin, you can’t just erase it. On the Day of Atonement, however, a very important ceremony was observed every year. Two goats were killed as a sacrifice. The first goat’s blood was taken into the Holy of Holies (which could only be entered once a year) and sprinkled on the mercy seat. This first goat made atonement for the tabernacle, the place where God would meet with His people. The second goat had all of the sins of the whole congregation - all of them - for all of the people - confessed on its head. Then it was led into the wilderness. Symbolically, the goat carried away all of the sins of the people. Jesus Christ is both the One whose blood provided a covering for our sins and carried our sins away when He died on the cross. The dry erase board looks like it’s completely ruined; it can’t be redeemed again for any use. But use the dry erase marker. Mark completely over the permanent marker until you can’t see the permanent marker any more. Now use the eraser. The permanent ink is gone. That’s what God says about our sins. He will remove our sins from us as far as the east is from the west (Psalm 103:12). This dry erase marker, which was unusable because of the marking on it, is now useful again. And we all, whose sin has made us unholy and unusable, is now made clean and is a useful vessel again for God’s glory. The Day of Atonement is all about redemption and cleansing and being made useful again for our God. The picture of this day is one of being saved to the uttermost because Jesus ever lives to make intercession for us. Amen. We started three months ago talking about the fruit of the spirit. Love: Like putting an ice cube in your mouth keeps you from tasting, the ice in your heart can keep you from loving other people. Joy: Like an ear of corn forms all of the kernels when the plant has access to abundant water and nutrients, so your joy can be full when you love and serve God. Peace: Like a sponge squeezed can only release what it has inside, you will show what’s really in your heart when you’re put under pressure. Knowing God and seeking to please Him is a good way to make sure your heart is filled with His peace. Patience: Like waiting for a tower of cups to be built, we often have to have patience in our lives. Patience is the fourth fruit of the Spirit. Kindness: Like trying to put toothpaste back into its tube, so our words cannot be unspoken. We have to be careful about what we say and what we do - to make sure that we are kind. Goodness: A bad apple can negatively affect the whole barrel. We must choose to act in good and right ways. Faithfulness: As a dog is faithful to its master, so we must choose to be faithful to our Master, Savior and Soon-Coming King. Gentleness: As you have to be careful driving your little cars around a house of cards, so we must be very gentle in the things we do and the words we speak. Self-Control: Like trying to hit a ball on a tube with just the right amount of force so that it will drop into the jar, so we must learn to control our actions - not too little, not too much. But just right. Having each of these fruit of the Spirit is another way of saying that Christ is formed in us. His character, His ways of conduct, demonstrate the fruit of the Spirit perfectly. But like a candy mold can shape the candy into different shapes, we all look different on the outside. It’s when you taste the candy that you know it’s sweet. Similarly, when Christ is formed in us, our actions and our words are evidence of what’s inside. We need to seek God with all of our heart, until Christ is formed in each of us! How important is light? It’s very important! Without light we would not be able to see anything. That would make life very hard. We can wear a blindfold and get a little idea of what it would be like to live in total darkness. It would not be easy. But there are blind people in our world who are still able to function. They’ve learned how to live in a world without being able to see. Just like you’re able to figure out what I’ve put in your hand just by touch. You can still figure out what’s going on in the world around you using your other senses. Walking downstairs at night, in the dark, you move by feel and by sound. You know your mom’s making spaghetti for supper before you ever see the kitchen because you know the smell. People who are blind have been able to figure out how to live in the world without sight, but it’s not easy. They have to rely more on the other senses that God gave them. But when we talk about seeing, we’re not always talking about actually seeing something. It’s like John Newton’s song, “Amazing Grace.” He writes, “I once was blind, but now I see.” John Newton wasn’t blind. There was nothing wrong with his vision. But there was something wrong with his understanding about the world, the plan of God, sin, and what God desired from him. Once John Newton understood that he was sinning, that sinning was (and is) bad, he could actually “see” the truth. Have you ever had trouble understanding something? Once your parents explained it to you, did you say, “Oh, I see”? You weren’t really saying that you “saw.” You meant that you understood what they were saying to you. So let’s talk about the light that God created on Day One of creation week. Where did that light come from? Well, obviously it came from God. But the light wasn’t shining from the Sun or the Moon or the stars. None of them were created until Day Four. So what was the source of the light? There’s a clue in Revelation 22:5. “And night will be no more. They will need no light of lamp or sun, for the Lord God will be their light. . .” Did you catch that? The Lord God will be our light. He’s the One who gives us light so we can see. And that makes all the sense in the world, because He’s also the One who enlightens us so that we can understand. God is the foundation for creation, for light, for sight, for understanding. Our God is Everything! So the next time you understand something really cool, just remember it is God who created the light so you can see. Exodus 20:11 says, “For in six days the LORD made heaven and earth, the sea, and all that is in them, and rested on the seventh day.” God made everything in six days. O.K. So on what day of creation did God make water? Well, we know that God created light on day one. Genesis 1:3 tells us that. But in Genesis 1:2 it says that “darkness was over the face of the deep, and the Spirit of God was hovering over the face of the waters.” So it sounds like the earth and the water were created before light on day one. Then, on day two, God began working with the raw materials, the initial creation. He put an expanse between the waters. The NIV says “vault.” The NLT says “space.” The ESV says “expanse.” The KJV says “firmament.” What was it that God created? New International Version And God said, "Let there be a vault between the waters to separate water from water." New Living Translation Then God said, "Let there be a space between the waters, to separate the waters of the heavens from the waters of the earth." King James Bible And God said, Let there be a firmament in the midst of the waters, and let it divide the waters from the waters. This expanse divided the waters from the waters. On day two, God created a space between the waters above and the waters below. I think God took the water He created on day one and began working with it. He created the space between the water - what we call sky. Think about creating water and sky for a moment. All of the laws which apply to water - its ability to exist in three states, its specific heat, its density, the way it freezes, the way it melts, all of the unique properties of water which makes life possible!! We could talk about water and the laws it follows for weeks! The creation of water and sky is bigger than just the clouds above and the waters below and the sky in between, all of the atmosphere and all its layers. It’s also the water cycle. Think about it: you can envision water starting at the top of the mountain, melting from the glacier and snowpack. The water collects and becomes a stream. Then it becomes a river, and we grab some water to drink, as the river runs by, before it runs all the way to the sea. So then what? How does the water get back to the top of the mountain, to become the snowpack, to become the river so we have water to drink? God knew we would need a continual source of fresh water to drink. So He incredibly created the water cycle. Those waters above - it’s not just sky. It’s the clouds and the water vapor in the sky. Those clouds rain and provide water, but how do the clouds get back up there to rain again? Demonstration: Put water in the hotpot. Bring to boil. Look at water vapor rising. What keeps it from just continuing its path? God created all the rules to make the water stop at a certain level and to form clouds. (Hold a cookie sheet over the rising water vapor.) Then He created the rules of nature which would cause those clouds to drop that moisture. (Place ice on top of cookie sheet.) The water rises as water vapor. It forms clouds. It rains again as liquid (rain) or snow and ice (solid). We could talk about how water expands, not when it freezes, but before it freezes. That makes solid water less dense than liquid water - which helps to keep ponds from freezing all the way to the bottom and killing all the fish every winter. The separation of water above and water beneath (sky) on Day Two is absolutely amazing!! It’s something to think about the next time you drink a glass of water, or take a bath, or shovel 10 inches of snow. On Day One, God created Light. On Day Two, God separated the waters below from the waters above. On Day Three, God said, “Let dry ground appear.” The earth had to be re-shaped so that the water would not cover the whole earth. If you had a container full of rocks, and the water covered over the top of the rocks, what would you have to do to get dry rocks? You might make a deep trench in the middle of the water. Or you might push the rocks up out of the water. Maybe you’d heat up the rock until it exploded out of the water over and over until an island appeared. Well, we do have a deep trench in the middle of the ocean. The Mariana Trench is 1580 miles long, 43 miles wide, and 6.8 miles deep. To put that in perspective, if Mt. Everest were put into the trench at the deepest point, its peak would still be 1.2 miles under water. We do have land being pushed up out of the water. The earth shifts along fault lines; we call them earthquakes. Sometimes they grate back and forth. Sometimes the pressure pushes one plate under the other, lifting the second plate! That’s how scientists think the Rocky Mountains formed. We do have soil melting and exploding out of the water over and over again, forming islands. There are numerous volcanoes in the water which erupt, oozing hot magma into an ever-increasing pile until a new island is born. That’s how scientists think the Hawaiian islands were formed. But God didn’t just make a pile of rocks emerge out of the water; He created soil, land, tillable ground that is good for growing plants. There were nutrients in that soil so that plants would flourish. The soil would hold just the right amount of water, but not hold too much. The soil would be solid, but not so hard that roots couldn’t push through it. How do I know that? Because on Day Three, when God made the dry land, then He said, “Let the earth sprout vegetation” (vs. 11). All of the fruit trees and flowers! Shrubs and grasses! Cacti and vegetables! Think about the incredible diversity of plants and the unique needs of each plant! One plant grows really well where there’s lots of water. Too much water will kill a cactus. One plant needs lots of sunshine. Another plant grows better in the shade. One plant needs more acidic soil. Another needs more alkaline soil. God did all of that. He just spoke all of it into existence. The land and the plants go together so well. The plants hold the land in place so that water and wind can’t carry the soil out of the country. The soil provides nutrients and grounding (I couldn’t resist) so the plants can grow big and strong. Sometimes when people think about Day Three of creation, they think only of the formation of land, mountains and valleys, islands and canyons, plateaus and grasslands. But God specifically formed the dry ground as the perfect place to create a plethora of plants. We sing “we plow the fields and scatter the good seed on the land” as a well-known Thanksgiving song. How appropriate to remember to thank God for creating the wide variety of soil types and plant life!! So we’ve been talking about creation week. On day one, God created light. On day two, God separated the water below from the water above, making sky. On day three, God created dry land and all of the plants. On day four, God created the sun, moon and stars. The Sun provides energy that the plants use. The plants take that light energy and turn it into food for themselves and then release oxygen into the air for our use. God said that the sun, moon, and stars were for signs, seasons, days and years. The revolution of the earth around the sun makes our year. One time around is one year. But as the earth is going around the sun, so the moon is going around the earth. That makes our months. As we watch the moon growing fuller every night, we know we’re getting towards the middle of the month. As we see less and less of it, we know we’re getting towards the end of the month. The rotation of the earth makes one day. So the sun, moon, and stars are God’s calendar in the sky - not just telling us when each day, month, and year begins; the sun, moon, and stars also determine the dates for God’s holy days! David wrote in Psalm 19, “The heavens declare the glory of God, and the sky above proclaims his handiwork.” The sun, the moon, and the stars are a continual reminder of how great our God is. We depend on the sun for light to see, plants to eat, and trees to build houses out of. The sunlight warms our planet. The seasons determine our planting our gardens and harvesting the food. And God’s calendar reminds us to worship Him, to praise Him and thank Him for Who He is and what He’s done. It’s really something to think about. God didn’t just speak the sun, moon, and stars into existence; He planned their exact location and their precise interaction with earth. The sun, moon, and stars were not just flung into position; they were carefully planned and placed right where God wanted them. That’s a good reminder for you that God has plans for your life and He’s placed you right where He wants you to be. Now, we just need to recognize His sovereignty and give Him the glory . . . . always. We’ve been talking about creation week for the past month. On day one, God created light, and separated the light from darkness. And there was darkness and light - day one. On day two, God separated the waters above from the waters below. We talked about the sky and the water cycle. On day three, God separated dry land from the water and then He created all the varieties of plants. On day four, God created the sun, moon, and stars. So what did God create on day five? All of the creatures that swim in the waters and the birds that fly in the air. So let’s think about this progression for a couple of minutes. If I want to sew a button onto material, there’s a logical order that I have to follow. I have to do the steps in order. Otherwise, it won’t work. What if I put the thread through the button? Will that work? No, there are holes in the button, but there aren’t holes in the material. So I have to use the needle. O.K. So I’ll just put the needle through the button into the material. But if I don’t thread the needle first, the button isn’t going to be attached. What if I’m not paying attention? I could end up sewing the button on the wrong side of the material! O.K. So the needle is threaded. The button is on the right side of the material. I can start sewing. But there’s one more problem: if I don’t put a knot in the thread, what will keep the thread from pulling out of the material? In the same way, when God created our world, He did it in a very logical, sequential way. He created light. Then he separated the waters below from the waters above. Once He had water, then He could put boundaries on the water to create the dry land. Once there was dry land, God created the plants. It wouldn’t have worked to create plants before there was dry land or rain to water them with!! And then God created the sun, moon, and the stars. The plants were already in place; now they were ready for the energy from the sun so they could grow! Everything was done logically and in order - just what you would expect from our God. Everything He does is perfect and right and very good. So what would you expect God to create next? He created the creatures in the waters and the birds in the air. There were already plants for them to eat. There was the sun to keep them warm. The birds had trees to make nests in. God commanded the water creatures and birds to be fruitful and multiply and fill the waters and the air. And God saw that it was good. Exodus 20:11 says, “For in six days the LORD made heaven and earth, the sea and all that is in them . . .” So when did God create light? Day one. When did God separate the water above from the water beneath? Day two. When did God create dry land and plants? Day three. When did God create the sun, moon, and stars? Day four. When did God create all the water creatures and birds? Day five. So when did God create all of the land animals? On day six. So name some land animals. Cows, horses, alligators, dogs, cats, monkeys. What about people? Yes. We live on land. We are included in that category of Exodus 20:11: “For in six days the LORD made heaven and earth, the sea and all that is in them.” We’re on the earth. People were created on the sixth day of creation, along with the rest of the land animals. What about hippopotami? Yes. What about kangaroos? Yes. Both of these are land animals. What about monitor lizards? Chameleons? Komodo dragons? Yes, the lizard family was also created on day six. So what about dinosaurs? Dinosaurs are part of the lizard family. They are big lizards. So they would also have been created on day six. Evolutionists would like you to believe that lizards like dinosaurs existed long before people existed. That’s not what the Bible says. They would also like you to believe that dinosaurs evolved into birds. That’s not Biblical either! Not only were birds created before lizards, God created each kind of bird, water creature and land animal. His creation doesn’t just change from one kind of animal into another kind of animal. We are absolutely amazed at God’s creation. We are delighted by the tiny butterflies and hummingbirds. We are terrified by grizzly bears, cobras, and Komodo dragons. We are comforted (at times) by dogs and cats and horses. We are awe-struck by the clear nights when the stars look close enough to pluck from the canopy. We are grateful for the warm sun. We are thankful for water to drink. And we are, hopefully, motivated to thank and praise God for who He is and the creation which reveals His character, His eternal power, and divine nature to us (Romans 1:20). On day one, God created Light, separating darkness from light. And there was evening and morning, the first day. On day two, God created the sky, separating the waters below from the waters above. On day three, God created dry land, separating the dry land from the waters, setting a boundary of how far the water could come. Then God created plants. On day four, God created the sun, moon, and stars. On day five, God created all the water creatures and all the birds. On day six, God created all the land animals and Adam and Eve. But the week wasn’t finished. Like a huge puzzle, it was still missing a piece. What happened on the seventh day of Creation Week? Genesis 2:1-3 states: Thus the heavens and the earth were finished, and all the host of them. 2 And on the seventh day God finished his work that he had done, and he rested on the seventh day from all his work that he had done. 3 So God blessed the seventh day and made it holy, because on it God rested from all his work that he had done in creation. The Sabbath is a blessing from God especially for man. Each week, the Sabbath is the last piece of the puzzle which completes our week. Out of all the days of creation, the sabbath was the only one that was set apart and made holy by God. Why would that be? I think it’s because it’s pointing to the rest that we will one day have in Jesus Christ - when there’s no more sorrow or death, when we can truly rest in Jesus Christ. Each sabbath we get a taste of what it means to rest in Jesus and we look forward to the day when there is no more struggle, no more trouble, no more pain. We look forward to when all things are completed - as the sabbath completed Creation Week.